First off, I'd like to welcome Lisa Rogers to Good Choice Reading. The girls and I are excited to have her here. Lisa Rogers's Angelina's Secret will be going on tour for two weeks!! She will be having guest posts, excerpts, reviews and giveaways!! Yay!! Please check the schedule below and follow us through her tour. As a child, Angelina spent years in counseling learning that Josie, her imaginary friend, wasn't real, but it turns out her childhood friend wasn't imaginary after all. Now Angelina has to accept she's either (A) crazy or (B) able to see ghosts. Wanting to believe in her sanity, she chooses (B) and welcomes Josie back into her life. But even Josie can't help her deal with Shelly, the spirit of a confused teenager, and things go very, very wrong. When Angelina finds herself in a psychiatric hospital, she faces a choice: she can spend the rest of her life pretending to be someone she isn't, or she can embrace who she is and take a chance that she may never get to go home. Lisa Rogers worked in the medical field until she hung up her stethoscope to help her husband pursue the dream of owning his own business. After opening the business while also raising their two (she insists) wonderful children, the time has come for her to fulfill a dream of her own—which is, was, and will always be, writing. 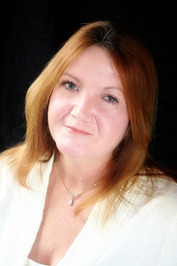 With her children now grown, she dedicates her time to writing and learning about paranormal phenomena. When she’s not strapped to her computer at their rural Oklahoma home, she can generally be found poking around a dilapidated old building or visiting some historical place, perhaps searching for her next “out of body” character. Angelina's secret is a book that caught my eye right away. And the minute I read this blurb, I knew I had to read it. I have a thing for books involving ghosts and spirits. So needless to say when I began reading this book, I couldn't put it down. I could have read it in one sitting but things such as work and house chores got in the way. So it took me two days to read. Angelina lives with a secret, her secret is that she can see ghosts. Her imaginary friend whom she had as a child turns out to be an actual ghost. The revelation didn't startle her one bit and she quickly comes to terms with her gift. But the fact that she can see ghosts isn't something that her family accepts so easily. So she struggles trying to figure out how to convinced them that she has a gift rather than her family thinking she's going insane. I really like the way the author wrote the relationships between Angelina and the ghosts. It made me happy to read that they weren't evil or harmful. I felt sad for Angelina, for the way her mother acted towards her in regards to her confession of her ability to see ghosts. I feel as a family, nothing anyone says should be shrugged off without listening to reason. Even if its something as absurd as the ability to see and communicate with ghosts. By her family acting the way they were was really bad for Angelina. Because she really didn't have the support she needed to accept her gift with ease. So seeing her struggles had me rooting for her all the way. This book was very well written. A 5/5 stars! And a definite Good Choice for Reading! Thank you all for stopping by but don't forget to visit Claire @ www.clairelouisereads.blogspot.com for her review. Have a great day everyone! Angelina's Secret sounds like a great read. Thanks for the great review. Let the tour begin! *throws confetti* And a BIG THANKS to Wanda and Good Choice Reading for sitting all of this up. I thoroughly enjoyed reading Angelina's Secret. It's a quick, but good read. I love the cover. So pretty. I watched the book trailer, it looks like a great read. Thanks for sharing! I will be adding this novel to my to-read pile.